I joined the Thebans in 2010 and it’s been one of the best decisions of my life. I’d played rugby for a few years at high school and in truth, I didn’t enjoy it; but when in my late 20s I wanted to make new friends and try a new challenge, rugby seemed an obvious – if slightly daunting – choice. Six years on, playing rugby is fantastic. It’s a chance to show my competitive, combative side in a way my banking career doesn’t enable me to. A chance to be part of a team; a real team where you fight for each other and have a big role to play. And whilst it can be brutal and it hurts sometimes, it’s a sport built on mutual respect and supporting each other. It’s amazing how quickly a few bruises or a broken arm heal after the final whistle, a hot shower and a couple of pints! Rugby is an inclusive sport and the Thebans gave me an amazing welcome. I was practically new to the game but it wasn’t an issue – we have great coaches and great facilities, so all the ingredients for learning and developing are there. Another key ingredient is pubs – after all, we’re rugby players and we like to socialise… I’ve made fantastic friends not just within the club, but among the many teams, both gay and straight, we’ve played across the UK, Europe and beyond. I even met my other half, Jack, on tour. But being a Theban is a serious business too, and as our committee’s Publicity Secretary I have extra responsibilities and am learning business skills to go with my rugby. That’s the impact rugby has on my life; and the more I’m part of it, the bigger the difference it makes. 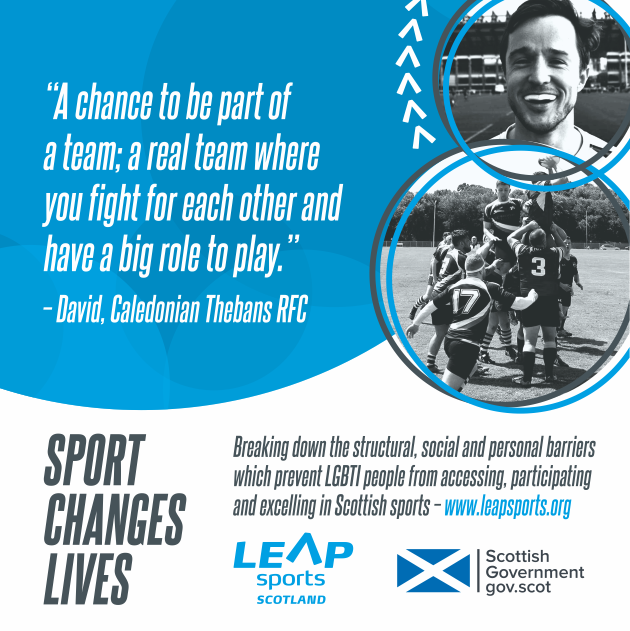 Caledonian Thebans RFC are Scotland’s first and leading inclusive rugby team, based at Edinburgh’s BT Murrayfield Stadium. Founded in 2002, the Thebans develop both new and experienced players, whether gay or straight, and represent Scotland in international rugby tournaments across the world. Written on 11th January 2017.